The tiny bundle of joy brings such changes in your life – all for the better! The wonderful journey has begun, which is why you need to start chronicling it as well. This is an exciting time for parents, so hiring abut finding the best professional for Newborn Photography in Los Angeles is not so daunting task anymore.a newborn photographer to take lovely pictures is a must-have experience for your family. Don’t worry – Linnea is there to lend a hand! However, newborn photography can be challenging to say the least, and knowing the best way to click pictures of babies takes both time and patience but finding the best professional for Newborn Photography in Los Angeles is not so daunting task anymore. Fortunately, you have an expert within reach – Linnea Lenkus – who has been dabbling with this style of photography for years. She knows exactly how to deal with newborns during portrait sessions, even if the baby is crying and not in the best of moods! Lifestyle is aimed toward a far more laid back session where the photographer comes to you and clicks the newborn in his or her natural setting. The baby is generally clothed and photographed against mom, dad and sometimes family pets. Stylized sessions are designed with special props like fabrics, baskets, etc. These sessions are done within a controlled environment where the temperature and lighting are crucial for obtaining a resting curled up baby. In a variety of images, the little one is placed in specific positions to showcase the face, hands, fingers, feet and toes. One of the most popular poses of newborn photography is the parents holding the baby with individual images of the mother and father with the child as well. Try to ensure the baby is in a happy mood – don’t try to force or cajole, or else the entire session might go to waste. Ideally, the session should be held when the newborn is either asleep or about to doze off. 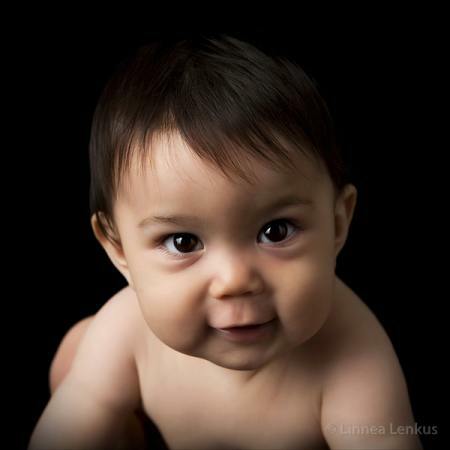 Linnea is a Los Angeles based photographer; specializing in portrait photography. Two of her studios are located in Long Beach and Pasadena, but she can schedule “on location” sessions as per your convenience. You don’t have to bother with the technical stuff – she takes care of all that with the help of her creative team. She uses a lot of “window light” that is artificially conjured in her portrait studio, as a frequent light source. Go ahead and fix an appointment to get the ball rolling!